UPDATE, JUNE 2018: Lucy Sparrow will make her West Coast debut August 1-31, 2018, at The Standard, Downtown LA with her fifth fully-felted art installation, Sparrow Mart. Stay tuned for more info! Based on her best-known work, one would assume that the British artist Lucy Sparrow is a city mouse, but when Standard Culture finally got through to the artist, she was deep in the English countryside where she lives on a farm of all places. To give us a sense for how remote her home is, she adds, “The nearest shop is about three miles away,” and that, ironically, made perfect sense. Three years ago, Sparrow created Cornershop in London, an art installation in the form of a fully-functioning British convenience store (aka corner shop) with a slight twist: every item in the store was handmade (with uncanny attention to detail) from felt. The plush project was intended to draw attention to the demise of these traditional UK mainstays. What she didn’t anticipate was that the response would be so strong. Reactions ranged from the expected double-takes, to shoppers who didn’t realize that the products were made of felt until picking them up, to people attempting to pay her with felt checks. Mostly though, people loved it. Sparrow’s creation touched a nerve, which turned the shop into a kind of viral spectacle for Londoners. Sparrow brought her Cornershop concept to The Standard, High Line in the Meatpacking District to make its American debut under the name "8 'till late," a fully felted Manhattan bodega. The concept required a bit of tweaking to get it right in the New York City context. Bodegas are near and dear to New Yorker’s hearts, and thus, we have protective feelings for these stores that supply the tissues when we have a cold, the late night snacks when we’re tipsy, the ice when the party runs out, and just about everything else a New Yorker needs to survive. In June 2017, 8 ’till late was open for business in the Garden Room at The Standard, High Line. It was supposed to run the entire month, but it had to close a week early because we couldn't stop her products from flying off the shelves. The aisles were full of beloved items—from felt candy and cereal to fluffy frozen pizza and bandaids—all of which were available for purchase. If you just missed the installation, check The Shop at The Standard, High Line as well as her website to see if you can still nab the goods. If you want to relive the fun, here's our interview with Lucy from before she installed her New York shop in our digs. We heard how corner shops are different from bodegas, why the details are so important, and got an answer to the burning question that was on everyone’s mind: will there be a bodega cat? THE STANDARD: What stage are you in right now with 8 ’till late? LUCY SPARROW: Everything is finished and ready to install. How challenging do you think the installation will be? I think it’s going to be as eventful as they usually are. There’s a lot of hard work to do, but it’s going to fun. We have more help than we’ve ever had and we’re more organized than we’ve ever been. Why do you think Cornershop was so successful? Surely it has to be about something more than just people liking felt objects. It’s very much about community. That is as much a part of the art as anything else. It’s an overwhelming experience. That’s something that only comes across actually seeing it in person. Photos can only go so far. Did you anticipate the reaction you received to Cornershop? I had absolutely no idea. And it was a specific sort of shock to have that kind of runaway success. Before that, I hadn’t done an exhibition that had been nearly as eventful. It went viral and sort of got away from itself. What are some of the differences between corner shops and bodegas? In New York, bodegas are the great equalizer. Is that similar to corner shops? Very much the same type of thing. What you have in a corner shop in the UK would be a cross-section of everything you could possibly need in an emergency. So they have one type of pasta sauce, one type of pasta, one type of tea. They’ve done their research about what you need. You know that you can go there and get a toothbrush or a newspaper or cigarettes. It’s a kind of lifeline for everyone, regardless of class. New York bodegas often feature a familiar cast of characters. Is it the same in the UK? Quite often the signs in a corner shop will say, “No more than two children at one time.” Of course, you get swamped by kids finishing school, going in, nicking [stealing] everything. So these poor shop owners are like, “No more than two children!" or “No unaccompanied children!” Meanwhile, there’s gangs of kids outside. How did you research New York bodegas? I came to New York twice in the lead-up. What struck me first and foremost was the cramped, overstocked atmosphere. And this sounds inconsequential, but the shelves are put together very differently. In the UK, we have a lot more newspapers and magazines because corner shops are news agents. We also wouldn’t have a deli. You wouldn’t be able to buy a sandwich. Do you have a favorite corner shop or bodega? I found one in Brooklyn and I also found one on the Lower East Side that I saw that I wanted ours to look like. The story for the installation is that it’s a chain of bodegas, almost like a franchise, so 8 ’till late is like a version of 7-11, but it’s a run down 7-11 that’s been let go a bit—a bit haywire, a bit rundown. So we’ve got things like a dead mouse that has fallen into a bucket of dirty water. We’ve got a fly zapper with dead flies. Do corner shops have cats? We absolutely don’t have cats in corner shops, but I’ve got a cat in the bodega because I was told that I needed one. That’s good to hear. Was there anything for the bodega that you particularly enjoyed producing? I really like the freezer section because you can have a meal in a box. There’s things like popcorn chicken and Lean Cuisine that I really liked making. Your packaging over there seems to have a lot brighter colors. It’s sort of technicolor, very appealing. The packaging is—not childlike exactly—but it’s much more cartoonish. A selection of felted products from 8 'till late. In interviews, you’ve talked about some of the different reactions you received from Cornershop. Do you have a favorite response? Were you working in felt before you did Cornershop? Yes. I’d never done it on that scale. But I’ve been making stuff out of felt since I was eight or nine. Forever basically. What’s your attraction to the material? Pure practicality, it doesn’t fray, and also it’s available in more colors than you can possibly imagine. The color-matching capabilities are absolutely awesome. And the fact that it’s used by pre-schoolers. 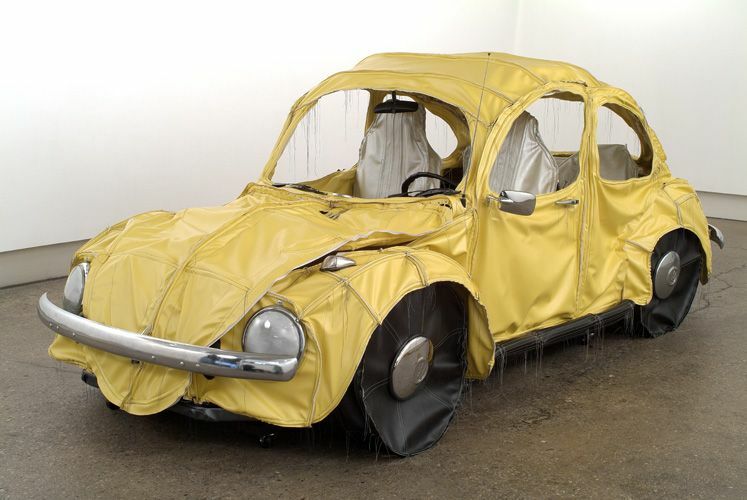 It’s a crass material, so rarely used in a fine art setting…apart from Joseph Beuys. I like that the whole art practice comes down to one material. The level of detail is really remarkable. How do you make sure that you’re getting the details right, or getting the level of detail right? I think the appeal of doing shows like this is that the viewer finds it hard to believe, the amount of detail. People get really overwhelmed when they come in. Not so many people would be bothered to do that, but that’s the thing that separates it from if you were going to make things out of felt and sell them on Etsy—it consumes your entire life. There’s no measure of what’s too much. It’s those extreme levels that I don’t see other people doing that make it an overwhelming experience. Sometimes I forget how weird it actually is. 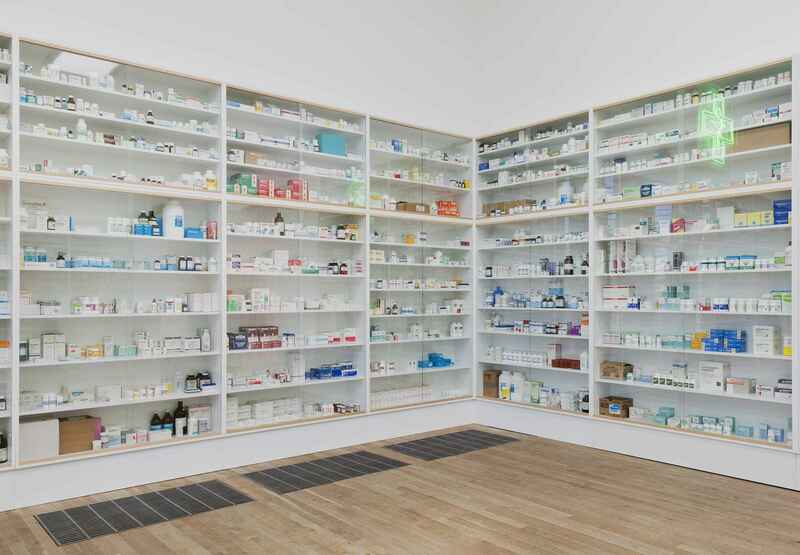 Are Damien Hirst’s “Pharmacy” or Oldenburg’s soft sculptures reference points for you? Without a doubt. I’ve always been fascinated by things that are made out of other things, like soft things that are hard, or things that are too big or too small, anything like that fascinates me because it takes a certain scale of material to blow up something normal into something else. The project also turns the art world model on its head—rejecting a few monumental works at astronomical prices for a monumental number of smaller works that are more affordable. It’s a very important part of my installations that anyone can go into an installation and buy a piece of art. It’s accessible to absolutely everyone. It’s not in any way elitist. OK, so it’s 3 in the morning, you’ve been drinking, what are you going for in the bodega? Crisps, something salty, but maybe some chocolate, as well. Something greasy definitely. So maybe like a big sandwich. Maybe some more alcohol. I used to work the nightshift and I’d go into a corner shop at six in the morning. I wanted to eat everything.